For 20 days, Maurizio Sarri was worried, but as soon as Chelsea’s new head coach spoke to Eden Hazard he realised why the club were never seriously concerned they would lose their star man this summer. Hazard fears his Real Madrid dream may have died and yet his mood has at no stage matched the colour of the blue shirt he has started a seventh season in. It is now up to Sarri and Chelsea to convince Hazard to sign a new contract, and the charm offensive started on Friday when the Italian claimed the forward could become the best player in the world. Hazard will get a hero’s reception when he steps on to the Stamford Bridge pitch for the first home game of the campaign against Arsenal on Saturday. Cesar Azpilicueta will once again be captain, but Sarri has not ruled out making Hazard his full-time captain, which would complete quite a turnaround since the Belgian tested the water over a move to Real. Fans feared the worst when Hazard announced “it might be time to try something different”, following Belgium’s World Cup play-off victory over England, but Chelsea were already adamant he was going nowhere. Hazard has never tried to hide the fact that his childhood dream was to wear the white of Real, like his hero Zinedine Zidane. And yet it was Barcelona who first made inquiries over a summer move for the 27-year-old through their director of football, Eric Abidal. Sources have claimed that Chelsea value Hazard in excess of £200 million and that is almost certainly true. But an official figure has never been put on his head because director Marina Granovskaia has simply refused to negotiate over him. Real received a straight “no” when they asked about buying Hazard a week after the World Cup. And when Real managing director Jose Angel Sanchez brought up Hazard’s name in negotiations over Thibaut Courtois, he was ignored. The message was clear – there was no conversation to be had. Having been encouraged to dangle a toe in Real’s direction by some of those in the Belgium set-up, Hazard quickly realised that it would be pointless to try to fight any harder for a move to Real. He knew that he had been third choice on their list of big-name targets, behind Neymar and Kylian Mbappe, and he also knew that Real would not spend any more than the £105 million fee they received from Juventus for Cristiano Ronaldo. That kind of money was never going to force Chelsea’s hand and Hazard got used to the fact he would be staying at Stamford Bridge, eventually assuring the club they would have no problem with him. On the same day Courtois decided to remain in Belgium waiting for his Real move rather than report to training, Hazard was posting pictures on social media of himself back in London and having a haircut. He is not a political animal. In his role as Belgium captain, Hazard got dragged into the pre-World Cup row between the squad and the federation over image rights. But the country’s most marketable man did not see the problem and money is well down his list of priorities. Chelsea are prepared to pay him more than £300,000 a week to stay, but it will be whether Sarri can guide Chelsea back into the Champions League with a more entertaining style of football that will make up Hazard’s mind. He already knows that, even though he will have only 12 months remaining on his deal at the end of this season, Real may not come calling again. He turns 28 in January and Neymar and Mbappe remain more popular targets. Hazard values every available moment with his family and will be pleased that Sarri will relax Antonio Conte’s rules to allow his players to sleep at home before some home matches and following European trips abroad. He will also have no problem being asked to play through the middle, as long as he is not asked to chase long balls. 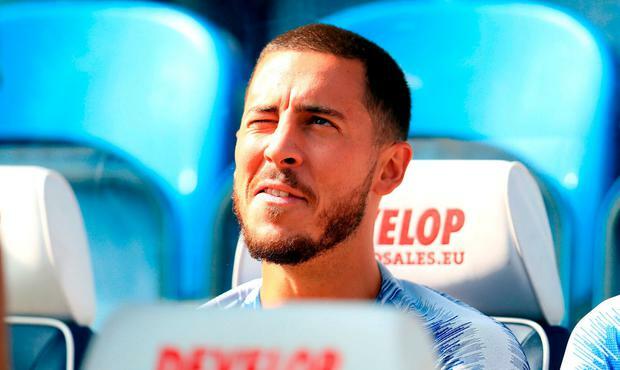 Sarri successfully converted Dries Mertens into a “false nine” at Napoli, but the move did not go so well when former head coach Conte tried it with Hazard last season. Hazard was particularly frustrated after the defeat at Manchester City, during which he barely touched the ball, and his discontent with Conte’s tactics could have resulted in him pushing harder for a Real move if the Italian had remained in post. When, ahead of the FA Cup final, Hazard announced he wanted to see “good players” at Chelsea before deciding whether to sign a new contract, it could have related to the star players still at the club as much as fresh blood. He knew that Courtois wanted out and that Willian would leave if Conte stayed, which was as much of a worry as who Chelsea were going to sign. But, as well as keeping himself, N’Golo Kante and Willian, the club signalled their intent by making Kepa Arrizabalaga the most expensive goalkeeper in the world to replace Courtois and beating Manchester City to midfielder Jorginho. Instead of raiding the likes of Leicester City, Torino and Monaco, as they did last summer, Chelsea have also taken Mateo Kovacic on loan from Real, prioritising quality over quantity. To Chelsea, Hazard is one in 200 million – something they believe he can never be among the Bernabeu Galacticos. Sarri must hope that opinion never gets tested.